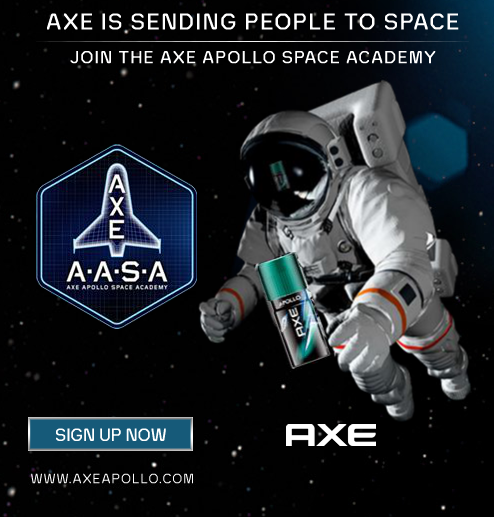 Axe Philippines announces the search for the first Filipino astronaut to be sent to space. In partnership with an American space travel agency called Space Expedition Corporation (Space XC), the iconic male fragrance brand AXE (known as LYNX in some countries) embarks on a massive global undertaking to send civilians to space. Axe Philippines confirmed that one of those who would be sent to space will be coming from the Philippines. The program is called the Axe Apollo Space Academy (AASA) which would be considered one of the most historic marketing campaigns ever launched in the country today. The selection process will consist of several stages and challenges designed to determine who the best person for the job. The first step is to sign up for the mission at www.AxeApollo.com. Ten thousand people from different participating countries will eventually be invited to go through the rigorous series of challenges. Two Filipinos will be selected to undergo training at the Axe Apollo Global Space Camp in Orlando, Florida. After spending some time in space camp, one of the two Filipino representatives will be handed the mission to go where no Filipino has gone before. “The program we’ve launched is an opportunity for our great nation to join the global community in taking the next big leap. We’re very excited to meet the first Pinoy astronaut. It could be anyone,” says Gem Laforteza, Axe Brand Manager in the Philippines.